Roll-formed, ribbed steel shelves have box beam reinforced edges to provide increased load capacities. Quad clip safely secures shelves to uprights while allowing easy adjustment on 1" centers. Heavy duty 14 gauge steel uprights support shelves. Closed side and back panels retain loads. Gray baked enamel with anticorrosion undercoat last for years. Starter Unit includes 4 uprights, 5 shelves, 4 quad clips per shelf, 1 back and 2 side panels plus all required nuts and bolts. Add-On Unit includes 4 uprights, 5 shelves, 4 quad clips per shelf, 1 back and 1 side panels plus all required nuts and bolts. Global Steel Shelving - 18 Gauge - 97" High - Closed Are Used For Fastening Applications Requiring A Smooth Surface Or Appearance. Global Steel Shelving - 18 Gauge - 97" High - Closed are made of steel with an anti-corrosion gray baked enamel undercoat for long lasting durability. Starter Unit designed with roll-formed, ribbed steel shelves with box beam reinforced edges to provide increased load capacities. Quad clip safely secures shelves to uprights while allowing easy adjustment on 1" centers. Heavy duty 14 gauge steel uprights support shelves. Closed side and back panels retain loads. Starter Unit includes 4 uprights, 5 shelves, 4 quad clips per shelf, 1 back and 2 side panels plus all required nuts and bolts. Add-On Unit includes 4 uprights, 5 shelves, 4 quad clips per shelf, 1 back and 1 side panels plus all required nuts and bolts. Starter Unit shelf quantity is 5. Shelf capacities are 525, 540, 550, 560, 725, 750, 775 and 785. Widths are 36" to 48". Depths are 12", 18", 24" and 30". Height is 97". Additional Starter Units, Add-On Shelving and Additional Shelves are available. 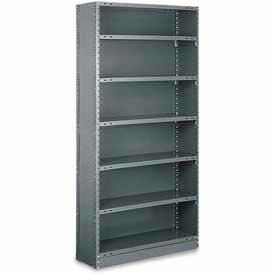 These 87" High industrial steel shelving units feature 14 gauge cold rolled steel uprights for strength and rigidity. Posts allow shelf height adjustments at 1-1/2 increments. Choose from 20 and 22 gauge steel shelves that include zinc-plated shelf clips for easy installation and height adjustments. Uprights are punched on 3 centers for easy anti-sway brace or panel installation. Welded 12 gauge foot plates allow floor anchoring. Beaded front uprights are roll formed into an 11/16 W x 2-9/16 D tubular section and have rear flanges that are welded on 6 centers to provide maximum strength. Open Shelving Units include 11 gauge cold rolled steel side and back anti-sway braces for rigidity of shelving unit. Closed Shelving Units include 24 gauge cold rolled steel panels that enclose unit to retain contents. Starter Units include 2 beaded and 2 angle posts, 5 shelves and cross braces or panels. Add-On Unit includes 1 beaded front post and 2 angle back posts, 5 shelves and cross braces or panels. Gray enamel finish. Easy assembly. Hallowell H-Post High Capacity Closed Shelving Are Used For Industrial And Commercial Shelving Applications. Hallowell High Capacity H-Post Shelving is made of steel with Platinum Backs & Shelves for long lasting durability. Post strength provides stability for multi-level high-rise applications. Available in open and closed styles with heavy and extra heavy-duty shelves. Shelf quantities are 5, 6, and 8. Shelf load capacities are 450, 500, 800, 900, 1200 and 1250. Available as Add-On Unit or Starter Unit. Imperial Shelving Offers A Versatile Storage Solution Designed For Any Office Environment. Uniquely designed shelving saves up to 60% floor space compared to conventional filing equipment. Perfect for tab filing, making files more visible and accessible by keeping them upright and in order. 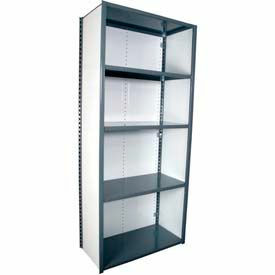 Steel shelving is attractive and functional for the front office, as well as, rugged for the warehouse or storage room. Double walled T-post uprights feature welded steel panels, steel shoulder rivets and shelf supports to withstand up to 400 lb. shelf capacity. Steel shelves are height adjustable at 1-1/2" increments. Includes non-marring molded polyethylene floor caps to protect floors and carpets. Single (Front) Entry Shelving includes five large 10-1/2"D x 7-1/2"H adjustable dividers per shelf that adjust along the backstop at 2" increments to keep folders upright. Shelves include backstop to retain files. 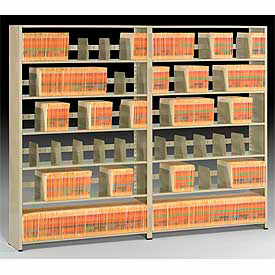 Double (Front & Back) Entry Shelving includes 10 dividers per shelf and helps maximize space and efficiency. Utilizes a center stop for easy installation of dividers on either side. Add-On Units include one less pair of uprights and one less side panel to easily connect to Starter or other Add-on units. Helps create rows or aisles of shelving using common parts of previous units. Sand enamel finish. Easy assembly. 12" & 24" Deep Units are Letter sized. 15" & 30" Deep Units are Legal sized. 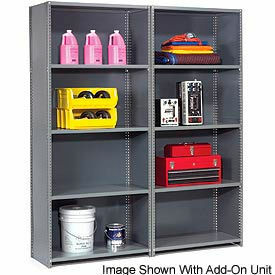 Lyon® Closed Steel Shelving Can Serve As Room Dividers And Offer Protection Of Stored Items From Dust And Sunlight. Lyon® Closed Steel Shelving feature sturdy construction and easy installation that makes offset angle shelving perfect for applications calling for stand-alone sections. T-Post upright design is made of durable, roll-formed steel and allow easy and quick shelf adjustment on 1-1/2" increments for long lasting use. 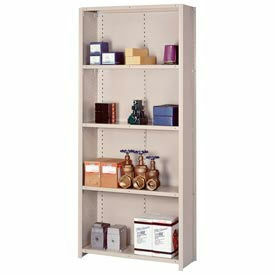 Starter units provide all necessary components for a complete shelving unit. Add-on units allow seamless addition of shelves onto existing freestanding closed shelving units. Available with 5, 6, 7 or 8 shelves per unit. Shelf capacities range between 560 and 900 lbs. Colors are Blue, Gray, and Putty. Dimensions vary per model. **Additional sizes & colors are available upon request. Lyon® 39" High Closed Counter Steel Shelving Is Used For Inspection Work, Shipping Rooms, Assembly Departments And More. 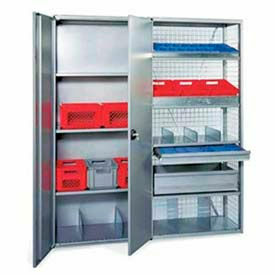 Closed counter shelving provides barrier separations for partitioning off areas, plus concealed storage under the top. Reinforced 14-gauge steel countertop provides lasting durability and strength. All shelves are adjustable at 1-1/2 increments. 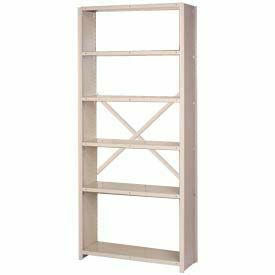 Available in 3 Shelf or 4 Shelf configurations. Heavy Duty shelves hold up to 800 lbs. Traditional shelves hold up to 700 lbs. Shelf Add-Ons are made with only one wall to add seamlessly onto the Shelf Starters. Available colors are Gray and Putty. Lifetime Limited Warranty. Lyon® 84" High Open Back Steel Shelving Is Used For Warehouses, Shipping Rooms, Storage Areas And More. Open Back Shelving provides easy visibility for all shelf contents. Lapped and welded shelf corners provide added strength and durability. Each unit includes 6 shelves. Shelves are height-adjustable at 1-1/2 increments. Includes side panels to enclose unit. Shelf Add-Ons are made with only one wall to add seamlessly onto the Shelf Starters. Choose from Traditional, Medium Duty, Heavy Duty or Extra Heavy Duty. Shelves measure 36 W x 84 H and are available in depths of 12 , 18 or 24 . Available colors are Gray, Putty and Blue. Lifetime Limited Warranty. Tri-Boro Closed Shelving Provides Organized Storage In A Variety Of Industrial Environments. 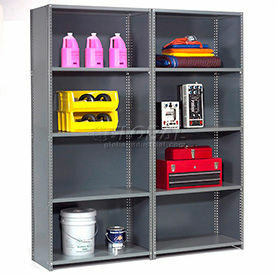 Tri-Boro Closed Shelving is constructed of heavy duty steel with a powder coat finish for long lasting durability. Full welded box formation in front and back of shelf with formed channels on both ends provide added strength. All four corners are lapped and welded for additional strength. Box formation welded on 6-inch center minimum provides integrity to entire length of box. All shelves have box profile height of 1-1/4 inches. Designed to accommodate either clip or nut and bolt connection to upright and punched for dividers on 1 inch centers. Boxer™ shelves are compatible with all existing Tri-Boro shelving components. Number of shelves are 5, 6, 7 and 8. Height is 73 in.. Widths are 36 in., 42 in. and 48 in.. Depths are 12 in., 15 in., 18 in., 24 in. and 30 in.. Color finishes are Dark Grey and Mist Gray. Weight capacities vary from 375 lbs to 600 lbs. 1 Year Limited Warranty. Tri-Boro Klip-It Closed Shelving Provides Supporting Strength For Heavy Duty Storage Uses. Tri-Boro Klip-It Closed Shelves are constructed of cold rolled 18 gauge steel with a baked on powder coat enamel finish and triple bends on all four sides for incomparable strength and long lasting durability. Clip-type assembly saves time. Offset angle post supports heavy loads and accommodates compression clips. Rust resistant phosphatized cleaning allows for better paint adhesion and durability. Compression clip rapidly snaps into post allowing independent adjustment of shelves. Normal shelf loading increases locking action. Closed units include back and end panels. Starter units include 2 sway braces. Add-on units include 1 sway brace. Types are Add-On and Starter. Number of shelves are 5 and 6. Height is 73 in.. Widths are 36 in., 42 in. and 48 in.. Depths are 12 in., 15 in., 18 in., 24 in., 30 in. and 36 in.. Color finishes are Dark Grey and Mist Gray. Weight capacities vary from 350 lbs to 775 lbs. 1 Year Limited Warranty. Tri-Boro T-Bolt™ Closed Shelving Units Are Used For Commercial Or Industrial Storage Applications Where Containment And Stocking Continuity Is Desirable. Tri-Boro T-Bolt™ Closed Shelving Units are solidly constructed of heavy duty steel for long lasting strength, durability and dependability. Offset angle posts support heavy loads and accommodate compression clips. Bolt-Type assembly for permanent and secure placement. Triple Bends on all four sides for added strength. Rust resistant phosphatized cleaning for enhanced paint adhesion and durability. Baked-on Dark Gray or Mist Gray enamel finish. 5 and 6 shelve units are 87 inches in height and available in 36, 42 and 48 inch widths and 12, 15, 18, 24, 30 and 36 inch depths with 350 to 775 lb. shelf load capacity. Choose Starter Units that include back and 2 end panels or Add-On Units that include back and 1 end panel. 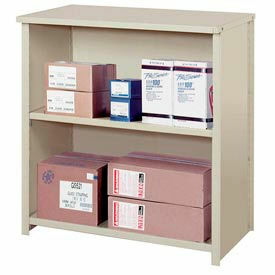 Equipto Closed Steel Shelving - 18 Gauge - 84" High Carry Loads Up To 721 Lbs Per Shelf. 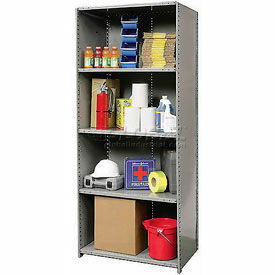 Equipto Closed Steel Shelving 84" High are made of rugged 18 Gauge steel for long lasting durability. Sturdy beams engage V-Grip upright posts for rigid connection. Provides 4 levels of storage. Side and back panels are reflective white. Available width is 36" and 48" Available depths are 12", 18", 24" and 36" Colors are Smooth Office Gray, Smooth Reflective White, Textured Black, Textured Cherry Red, Textured Dove Gray, Textured Evergreen, Textured Putty, Textured Regal Blue and Textured Safety Yellow. Schaefer R3000 Closed Steel Shelving Provides Multi-Level Storage And Tilt Options. 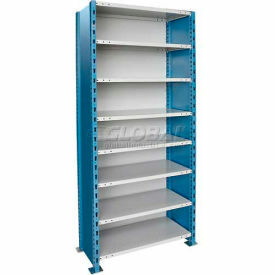 Schaefer R3000 Closed Steel Shelving is constructed of galvanized steel for long lasting durability. Available in solid or wire components with cross brace. All units contain 6 shelves that can be tilted at 6° or 12° for ergonomic picking and stock visibility. Two units connect easily for double storage. Measures 36" or 48" Widths and 85" Heights. Available depths include 12", 18" an 24". Color is Gray.